Over at Todd Woods blog about a month ago you could have found this interesting (and unintentionally amusing) statement. This automatically channels the Monty Python Spanish Inquisition sketch “Amongst our weapons are …” Anyway, he fixed the numeric discrepancy (without acknowledging the blogosphere who pointed it out), but minor typographical errors are not the reason biologists laugh at creationists . The reason we laugh at them is they are so gormless about biology. 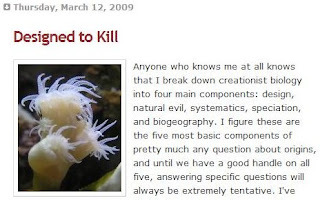 The point Dr Wood is making in that post is that animals (hey what about plants and protists) are “designed” to kill, which implies that God had an *active* role in making all things loathsome and nasty (cue Monty Python again), rather than us sinful humans being at fault and the world just degenerating. It is mildly amusing to watch the gears mesh, then miss completely obvious points. The problem is he is trying to explain the biological world without a understanding of even basic biology. Cue the Gary Larson cartoon of two bears watching children at play, and one says “Come on Harvey, look at these claws, these teeth, they’re not for eating nuts and berries”. Now, Dr. Wood uses the bear as a too simple example, rather than a key exemplar. But the real point is the biology as stated is wrong. Simple examination of the biology of the Panda shows it’s a carnivore modified to be a herbivore, rather than bears being herbivores modified to be carnivores (indeed the Pandas gut is only very slightly modified from the carnivore version). Again, this is why biologists laugh at Creationists, they just can’t get the biology right. Natural evil is a real problem for Creationists , if all was good and warm and fuzzy with no death before the fall, and only degeneration is allowed, where do carnivores with their splendid adaptations for killing and eating come from? The cannot allow themselves to consider evolution of adaptations (they will allow some evolution, but only trivial amounts). Bear evolution, for example, where bears originate from a long line of carnivores, is shut out from their minds. Carnivory has a long history, with even some bacteria (including the superbly named Vampirococcus) being predators. In example after example, Dr. Wood shows that biology is an incoherent mess without the unifying thread of evolution. And he doesn’t get it. Yeah, Man sins, evil and death enters the world and suddenly Drosera start thinking, “Hey, I’ve got these sticky tentacles, and digestive enzymes, I’m gonna get me some MEAT”. And what about the saphrophitic fungi eh? Why do they get short shrift, or Vampirococcus? As another example of the problem Creationist have with biology, I will refer you “Fellowship, Creation and Schistosomes” (Mace, Simms and Wood 2003) where Dr. Wood and others try to explain how the Schistosome parasites could have arisen . Note that this is a technical publication, a supposedly serious research article like a scientific paper. Now this was published back in 2003, and Dr. Woods position has eh, evolved a bit since then, but the paper is still cited as an example of serious creationist “research” and neatly illustrates the problems therein. Now creationists have a problem with Schistosomes. These are parasites that have a complicated life cycle. The eggs of the parasite are released in the faeces and if they come in contact with water they hatch into a miracidia, a free-swimming larva. The larva then has to infect a snail of the correct genus within one or two days. Inside the snail, the larva undergo asexual reproduction. After this another free-swimming larva, the cercaria, is shed into the environment and must infect a suitable vertebrate host. Once the cercaria penetrates the skin of the host it loses its tail and becomes a schistosomule. The worms then migrate through the blood vessels ending in the mesenteric veins where they mate and start laying eggs in the vessels of the intestinal wall. The eggs burrow through through the tissues and are passed in the faeces. Now the creationist problem, as stated by Dr. Wood, is that since everything was perfect before the fall, disease only entered the world after the fall. Also, the only post-fall developments could be degenerative, we can’t have any of the nasty evolution stuff (at least on anything other than trivial scales). But the complex life cycle of the Schistosomes clearly is a complex adaptation not a degeneration. How can they explain this? They decide that the Schistosmes were originally symbiotic (or mutualistic in some way), and then degenerated into a parasitic condition, possibly by infecting the wrong host. This is in itself not a silly idea, organisms that normally live elsewhere and accidentally get into the wrong tissues of the host can be an important source of disease, like gangrene. But it’s how they go about trying to establish this reveals their ignorance of biology. First they try and establish that Schistosomes are a “Created Kind” and compare them to the liver flukes (Fasciola). Now liver flukes also have a complex life cycle similar to the Schistosomes, with larva in molluscan hosts, and the formation of cecaria. On the basis that Schistosomes are sexual, and Fasciola are hermaphrodite and have a slightly different gut architecture, and ones cercaria must be eaten (but still actively burrows in through the gut lining), but the other directly invades via the skin, that they must be two separate “Created Kinds”. Well, we couldn’t have any of that nasty adaptive evolution happening could we? Except of course that Schistosomes and Fasciola are but two representatives of trematoda, a large class of parasitic worms that include a two host cycle, with one stage usually occurring in molluscs, the second usually in vertebrates. The cercaria is common to all the trematodes. As well as the liver flukes, there are the lung Flukes (Paragonimidae) and the intestinal Flukes (Fascicoliposis). These are just the ones of disease importance to humans. Then there is Bivesiculidae, the Transversotremidae, the Lepocreadidae and on and on. Indeed there are over 180 families of trematodes which have the life cycle and larval stages (including cercaria) associated with Schistosomes. Indeed, the Schistosomes considered by Wood et al are just one genus in the family Schistosomatidae, venous system specialists that infect reptiles, birds and mammals (including humans). Then there is the family of Spirochidae, blood vessel generalists that infect reptiles and Sanguinicolidae, blood system generalists that infect fish (See diagram above right, taken from Brant and Loker, 2005, click on it to embiggen). None of this is new, and was well established by 2003, when Wood’s paper was published. Now, Mace et al compare just two genera, and pronounce them separate “created kinds”, but when we have hundreds of genera, all with the Mollusc - Vertebrate infection cycle involving cercaria, then the idea that all these genera represent “created kinds” is just a trace unparsimonious (and can invoke Occam’s Razor). Or we could say that the “created kinds” just extend to the organ system specialization, but then there is massive diversity which means a whole lot of adaptive evolution is going on, with over a hundred of genera in any given family forming adaptive diversity in a variety of hosts and environments. And creationists just don’t like admitting to adaptive evolution. 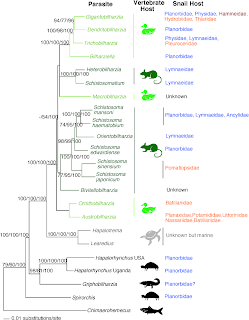 Then there is the one diagram in the article, which show hybridization data (which amusingly replicates the data shown by DNA studies, but those more modern studies imply that the Schistosomes and other trematodes are related by common descent) and infection data. Since the Schistosomes that infect humans have a broad species infectivity, so they take this as evidence that Schistosomes came to cause disease by invading the wrong host. However, the fact that even the Schistosomes that have a very narrow specificity (about a third of them) also are parasites too is a strong strike against this idea. Note that all Schistosomes are parasites. Indeed the over 1000 trematode species we know are all parasites. Note the pattern here? Mace et al, want the Schistosomes to be “fallen” versions of a mutalistic organism. What kind of mutualism requires a worm to burrow into the circulation and live in blood vessels is not explained, and there are no good examples of such extreme invasive mutualism. Indeed, given the extreme diversity of trematode worms, and the blood inhabiting trematodes (Schistosomatidae, Spirochidae and Sanguinicolidae) the utter lack of a mutatistic version of the trematodes is very telling. What’s more, it is hard to fit the actual biology of Schistosome infection with a “fallen” status. Schistosomes are venous specialists (except for one species that specializes in arteries). They must lay their eggs against the flow of blood, and engage in precision placement of eggs, the females back into the smallest venules and release eggs where the veins clamp down on them and hold the egg in place. The eggs them migrate through the blood vessels and into the gut. Such precision adaptations are incompatible with a “fallen” state. The recurring observations that supposedly “fallen” species have significant adaptations to perform their parasitism and carnivory has resulted in Dr. Woods musings. Creationists cannot accept that evolution is responsible for adaptations, so they must tie themselves in knots trying to explain how God designed in these adaptations (before of after the fall), and thus produced natural evil. This is why biologists laugh at creationists, they make their arguments with almost complete ignorance of biology, and even then the evidence of their cartoon version forces them into a corner that only evolution can get them out of. Oh yeah, the reference list. Almost all the real biology articles are very elderly, and ignores the comprehensive reviews of the evolution of of the Schistosomes that were easily available when the article was written. Note the authors did no original research themselves, just reviewed data obtained by real biologists. With my ability to create typographic errors, who am I to complain? As an Australian, growing up with our major religious traditions being Anglican, Catholic and Presbyterian, I find the literalists bemusing. We all got the idea that Genesis is filled with analogy and metaphor, heck I got that at age 10, when I was getting gold stars for my Bible verses, so why can’t the Creationists get it? While not a professional parasitologist, I spent 3 years a a laboratory scientist, and one of my duties was parasite analysis. So I know my way around parasites. It only took me a few minutes to find several contemporaneous references to the evolution of schistosomes that Mace _et al_didn’t cite. The creationists accept that species which hybridize are related by common descent, just like real biologists do. And the DNA data show that hybridizing species are mots closely related to one another, and other similar species are related, and slightly less similar species are related , and so on with no sign of the “discontinuity” the creationists insist on to separate “created kinds”.